As soon as the sun begins to shine my ballerina flats and gladiators are out of storage and into my wardrobe. Summer flats are the perfect combination of style and comfort. Living in London I always need a trusty pair of flats which not only carry me from meeting to meeting, while my heels are in my handbag, but also from day to night. I am in love with these orange and fuchsia butterfly sandals by Aruna Seth, a new brand now firmly on my shoe radar. These sandals will perfectly pop a silk tee and capri pants combo or team with a floaty summer dress. Jemima Vine's Edie metallic pumps are the epitome of luxury and are a must have shoe for all seasons. I highly recommend them. 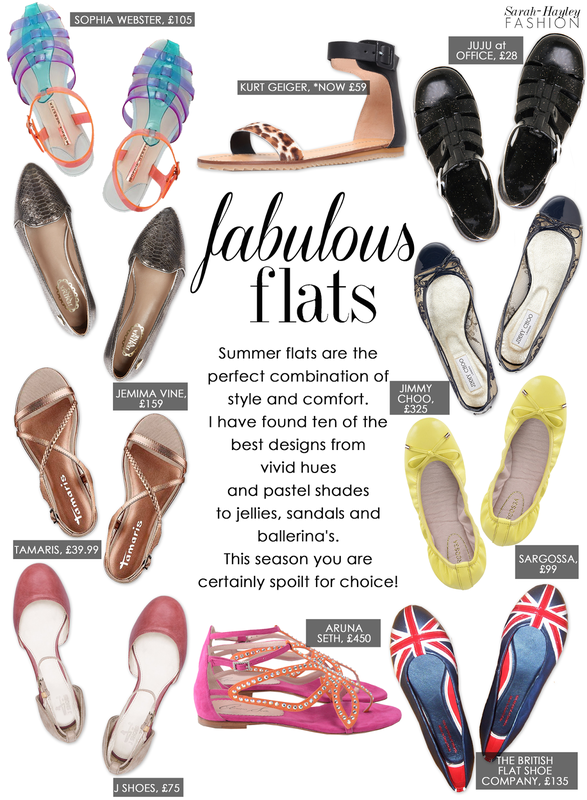 Take your pick from the fabulous flats above, your feet will thank you!